Harvard spent $600,000 lobbying the federal government in 2018, a figure $10,000 less than the amount the University spent in 2017. Though last year’s figure marked a slight decrease in expenses, lobbying costs have generally seen an uptick in the last five years as Harvard and higher education more broadly face a hostile political climate. The University’s Office of Federal Relations worked to combat an “unprecedented” 1.4 percent excise tax on colleges and universities with endowments larger than $500,000, passed December 2017, according to its quarterly lobbying filings with the U.S. House of Representatives Office of the Clerk. University spokesperson Jonathan L. Swain listed in an email Sunday several of Harvard’s lobbying priorities including combating the endowment tax and maintaining strong federal research funding and student aid. Swain also cited securing legal protections for undocumented students under Deferred Action for Childhood Arrivals — an Obama-era program that allows undocumented youth to live and work in the United States — as one of Harvard’s areas of focus. "The University is actively engaged in Washington on important institutional priorities that have an impact on students, faculty, staff, and our larger community,” Swain wrote. Harvard’s lobbying efforts coincide with an era when the University and its peers navigate several legislative and political challenges — most recently, the longest partial government shutdown in U.S. history, which temporarily ended last week. During the 35-day partial shutdown, more than 800,000 federal employees were either furloughed or forced to work without pay. At Harvard, funding lapses and restricted access to resources stalled some faculty members’ research projects. Despite the shutdown, Harvard’s lobbying efforts did not increase in the last three months of the 2018 financial year. The University spent $5,000 less in lobbying in the last quarter of 2018 than it did in the same time period in 2017. During the shutdown, Trump proposed exchanging temporary protection of DACA recipients for the funding needed to construct a wall at the United States southern border — a proposal Democrats have repeatedly renounced. 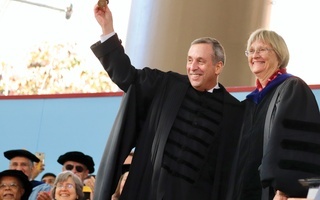 In the later years of her more than decade-long tenure, former University President Drew G. Faust made advocating for undocumented students one of her top lobbying priorities, a precedent University President Lawrence S. Bacow has continued. Since taking office, Bacow has met lawmakers in Washington, D.C., to advocate for legal protections for undocumented students. Roughly 65 Harvard affiliates were undocumented in the 2017-2018 academic year. 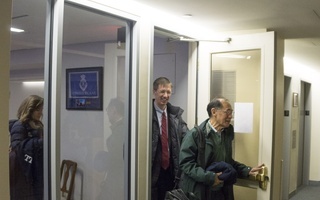 Swain also said advocating for those protected under Temporary Protected Status — a legal designation given to individuals from certain countries who have fled armed conflict or natural disasters — is another of Harvard’s lobbying priorities. Dozens of Harvard staff members who are protected under TPS still face uncertainty regarding their legal status, though a court order has temporarily stalled the Trump administration’s attempts to terminate the policy. Harvard spent more on lobbying in 2018 than all other Ivy League schools. Yale University and the University of Pennsylvania, which spent $570,000 and $522,000, respectively, came closest to Harvard’s total, according to the schools’ filings. Harvard’s lobbying expenditures fell between 2006 and 2012, according to its filings. In 2006, the University spent $760,000 in D.C. Beginning in 2011, Harvard’s lobbying expenditures remained below $600,000 — a trend that continued even as spending slowly increased until President Donald Trump took office in 2017 when spending topped $600,000 again. Harvard maintains a federal relations office in Washington, D.C., to lobby the federal government year-round. 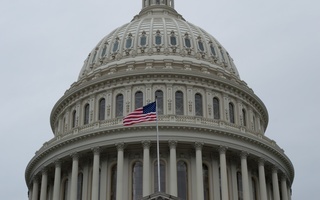 The office employs four full-time staff members and the law firm O'Neill, Athy, and Casey — a group that specializes in congressional relations — for lobbying activities on Capitol Hill. —Staff writer Alexandra A. Chaidez can be reached at alexandra.chaidez@thecrimson.com. Follow her on Twitter @a_achaidez. —Staff writer Aidan F. Ryan can be reached at aidan.ryan@thecrimson.com. Follow him on Twitter @AidanRyanNH.